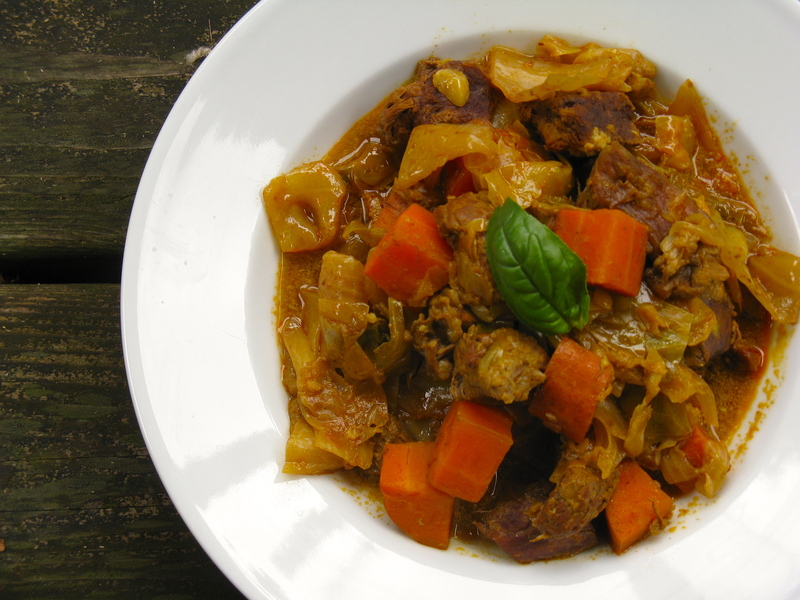 Curry and slow cooker meals are among my favorites, and here’s yet another one to add to the list: spicy curried beef stew. It’s delicious, hearty, savory and full of curry flavor. 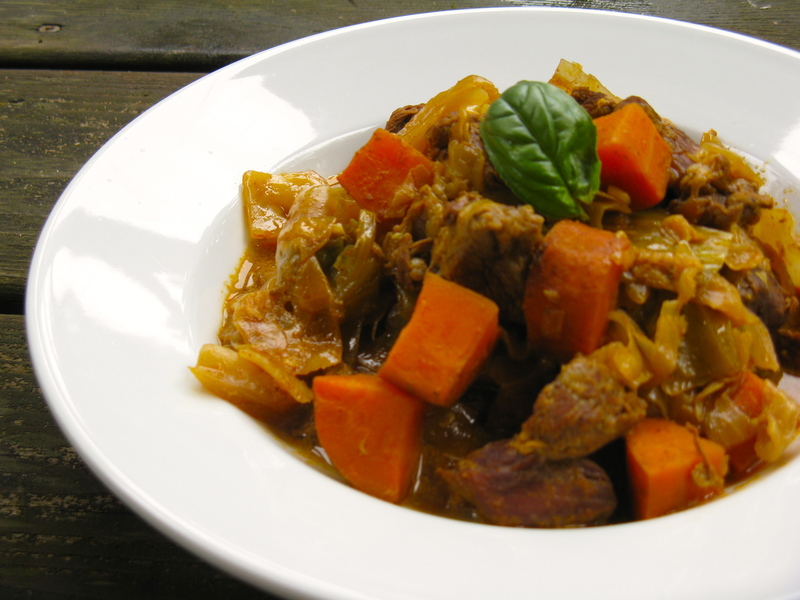 The vegetables are perfectly tender and the beef stew meat practically melts in your mouth. It’s a winning combination! Melt coconut oil in a large pan over medium heat. Add the onion, jalapeno and garlic. Stir to coat everything in the fat and saute a few minutes, until onions are soft. Once done, pour the onion mixture into the bottom of a slow cooker. Then, add the beef stew meat and chopped carrots on top. In a small bowl, mix together the curry, smoked paprika, cayenne and sea salt. Add to the slow cooker and toss with the meat and veggies, until well coated. Pour coconut milk and broth over top and stir. Place chopped cabbage on top of everything and then cover the slow cooker with the lid. Set on low for 6-7 hours or high for 4-5 hours. Halfway through, give everything a stir and then replace lid to finish cooking. I never get tired of the slow cooker either. 🙂 So easy and makes everything taste good. Thanks for another idea! I followed the recipe and it came out so flat in flavor, so disappointed after selling it all day while it cooked. Sorry to hear that, Jill. It turned out great for me, so I’m not sure what happened. Recipes aren’t a one-size fits all though and there’s always room for individual tweaking. Hopefully, you were able to add more spices and make it better? Hi! I made this for dinner tonight and it was delicious! The whole family loved it. I doubled it and left it in the slow cooker for 8 hours, plus one hour on warm (while away at work) and it turned out perfect. Thanks for this recipe. Will definitely be making it again.